Helen Simpson, from the Mushroom Shed, tells you all you need to know about growing mint. She has also written articles about growing basil, brassicas, chilli, coriander, cucurbits, garlic, ginger and turmeric, rhubarb, strawberries, tomatoes and lesser known herbs. 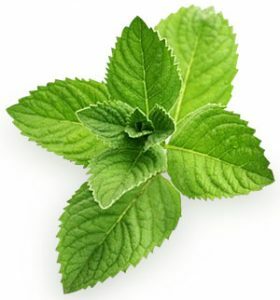 Mint (the Mentha genus) is well known for its rapidly spreading nature. But fewer people are aware that tens of species of mint – and hundreds of varieties – exist, many with their own distinctive properties. Mint is very aromatic, with the oil glands mostly on the underneath of the leaves. Rubbing or crushing the leaves gives off scent. Mint does well in a slightly shady position, although many varieties can be grown in sun, which creates a higher oil content in the leaves. Mint grows best in Spring, particularly with the ample rainfall we are currently experiencing. Come Summer and conditions are generally too dry for luxurious growth and the cold of Winter can cause some mint plants to be deciduous (but they are perennial and should re-grow in the Spring). Because of its invasive nature, many people grow mint in pots. But even in pots, it can sometimes spread due to its tendency to send out runners from the base of the pot. As seed can be tiny and hard to manage, and if you are saving your own seed there is the risk of cross pollination, mint is usually cultivated from cuttings, runners or root division. For cuttings, simply snip a fleshy stem from a mint plant and cut off the stem’s top, leaving around 6cm of stem. Strip off most of the leaves apart from a couple at the top of the stem and leave the base to grow roots in a glass filled with a few centimetres of water. Then transplant into a pot. Runners from the main plant will often run along the surface of the garden and take root in the ground by themselves. Once this has occurred, you can snip the rooted runner from the main plant – creating a new plant, if desired. Root cuttings involve digging up part of your mint plant and finding the vigorous white fleshy roots. These can be snipped into 3–4cm pieces and planted in a pot covering with about 1cm of potting mix. In a few weeks, leaves will start to form on the surface of the potting mix and a new plant will develop. Common or garden mint: lush, green, oval leaves. Most commonly used in cooking eg: tabouleh, mint sauce and jellies. Pleasant mint fragrance. Spearmint: similar to common mint, but the leaves are more pointed and the plant is less invasive. Strong spearmint smell. Peppermint: purple/red stem with small, oval green leaves. Very pungent peppermint aroma. Used in herbal teas. Moroccan Tea mint: a hybrid mint, with spearmint being one of the parent plants. Crinkly, small rounded leaves. Popular tea in Arabic nations when combined with green tea and sugar and commercially available as a loose leaf tea. Chocolate mint: similar to peppermint but with a slight chocolate aroma in addition to the peppermint fragrance. Apple mint: pretty, light green leaves, which may be variegated with white edge. The leaves are soft and hairy, with an apple aroma. Ginger mint: purple/red stem, with dark green leaves and a hint of ginger fragrance (some imagination required!) in addition to peppermint. Eau-de-cologne mint: popular some years back but less so now – strong eau-de-cologne fragrance. The leaves are large and more pointed than common mint. Purple stems. Pennyroyal: a creeping, prostrate mint with violet flowers. Not recommended for ingestion because it contains a toxic chemical called pulegone. Better used as an insect repellent. Corsican mint: tiny-leafed prostrate creeping mint with heart shaped leaves, making it look like a moss. Due to its shallow roots it can dry out easily, so keep moist. Basil mint: large oval leaves, with a strong basil smell – sometimes mistaken for basil. Stone mint: from North America – not a true mint but more closely related to oregano, Marjoram and Savoury. Oval dark green leaves with red square stem. Apart from a number of medicinal uses, stone mint goes well in Italian cooking. Vietnamese mint: unrelated to the true mints. Best grown in shade with plenty of water. Sometimes used in place of coriander. Pointed variegated leaves. Can I grow mint in April on south side of my house in Melbourne. Thank you. Your help is very much appreciated. You can grow mint all year round in Melbourne but I think it would be better for you to wait until August or September before planting it.